Equipped with a 505-gal. fuel tank, the G400 delivers 20 hours of runtime at 100 percent load. The largest onboard fuel tank on the market is paired with two diesel exhaust fluid (DEF) tanks to ensure DEF supply matches the available fuel supply. 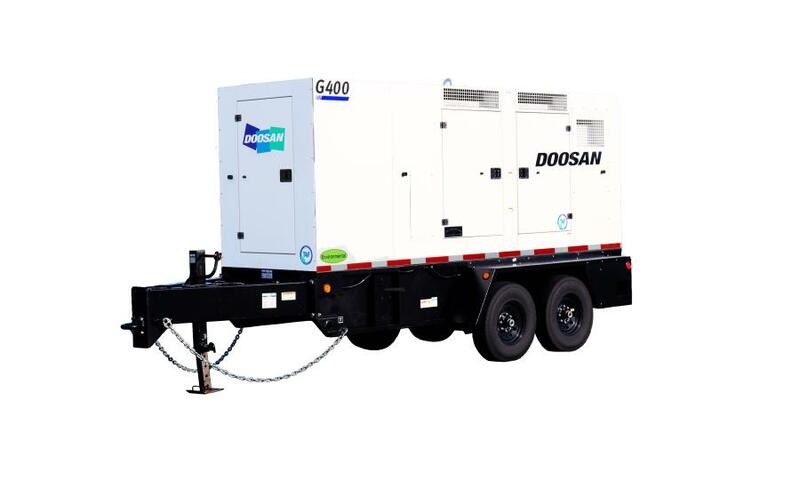 Doosan Portable Power has added the G400WCU-T4F mobile generator to its product line. The range-topping G400 model is the most powerful generator in the Doosan line, with a prime power rating of 402 kVA (322 kW), packaged in a compact footprint to meet a broad range of applications. Powered by a Tier IV-Final Cummins QSG12, 513-hp diesel engine, the power-dense G400 delivers reliable performance with class-leading motor-starting capability. The lightweight package and compact footprint allows for easier transport and requires less premium space on the job site, according to the manufacturer. The G400 is designed with the CoolBox Plus enclosure that features a variable speed cooling fan to ensure precision package cooling. This allows enhanced performance in extreme ambient temperatures, improved fuel economy and lower noise levels. The easy-to-use operator panel includes the powerful TG410 controller and is complemented by a full array of analog gauges, simplifying machine control and monitoring. The optional Deif AGC4 Power Management System greatly enhances the capability of the G400 and broadens its capability to support large, critical power projects. The model is equipped with a link board panel for multi-voltage configuration. Operators can select among 480V-3Ø; 240V-3Ø; 208V-3Ø and 120/240V-1Ø. Generator versatility is further enhanced with a dual-frequency switch, which allows operators to power 50 hertz applications with the flick of a switch. Each G400 generator is designed with an environmental containment system that prevents potential fuel or oil spills outside of the package. The system allows operators to focus on the job at hand while safeguarding the environment. A broad range of options for customizing the G400 to suit specific applications are available, including cold weather packages, remote fuel and DEF connections, battery chargers, camlock panels, and remote telematics systems. Doosan generators are designed to withstand rugged transportation and jobsite needs. Built on heavy-duty skid bases, the generators boast a 14-gauge, galvannealed steel enclosure and tandem-axle running gear for easy towing. The G400 is backed by a 1-year/2,000-hour package warranty; a 2-year/4,000-hour alternator warranty; and a 1-year/unlimited hour, 2-year/4,000-hour or 3-year/3,000-hour warranty on the Cummins engine.